First Line: The front door opened and a woman walked in. As the proprietor of a business called Questions Answered, Samuel Hoenig's Asperger's syndrome is more like a firm set of personality traits, and he uses those traits to successfully answer every question he's ever been asked. But he's at a bit of a loss when his newest client asks him about the real identity of her husband. Having no insight whatsoever into marriage, Samuel enlists the aid of his former associate Janet Washburn. Working as a team is going well-- until the body of the husband in question is found in Samuel's place of business. He's been taken for a fool, and he doesn't like it; therefore, he's more than willing to answer a new question posed by an unexpected inquirer: who killed the unfamiliar husband? Jeff Cohen ups the ante in his second Asperger's mystery featuring Samuel Hoenig. 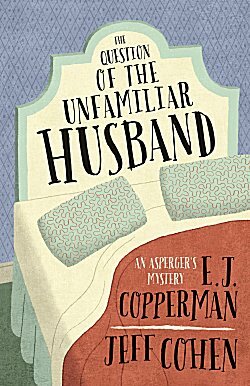 While enlightening for those readers unacquainted with people who have Asperger's, The Question of the Unfamiliar Husband is a truly enjoyable read with many laugh-out-loud moments and a devilishly clever mystery to solve. In the first book, The Question of the Missing Head, Samuel was seemingly obsessed with his timetable for exercise, and I have to admit that I was a bit worried that his persistence would carry over to this second book. Too much of a good thing is... too much. But Cohen is too smart for that. Yes, Samuel gets some exercise in this book, but now his main concern is vehicular safety, and I spent my time either being amused at his behavior... or agreeing with him. Once again, I am impressed with the parenting skills of Samuel's mother. The type of support "Aspies" get at home is crucial in how well they fit into society. Samuel's mother is a strong and very wise woman, and I admire her-- as I do the other woman in Samuel's life, Janet Washburn. Janet enjoys a good challenge, which is why she enjoys working with Samuel and his "questions" so much, and it's her calm demeanor and quick thinking that makes them such a good team. If you're going to be the sidekick, be the best, and Janet is. I like her so much that I hope she takes center stage in a future book. The solution to this clever mystery depends on so many things. Planted clues. A knowledge of Christie. A coincidence. And not blindly following accepted beliefs about certain groups of people. The Question of the Unfamiliar Husband certainly kept me smiling and guessing. One of Samuel's endearing traits is his insistence that he can tell a lot about a person by that person's favorite Beatles song. I wonder what he would tell me if I let him know that mine is "In My Life"? Samuel, his mother, and Janet have certainly worked themselves into my heart, and I look forward to their next adventure with a great deal of anticipation. I have to say, Cathy, that I'm already drawn in by the title. It's great! And it sounds as though it keeps the reader engaged, too. It's tricky to write about characters with disabilities such as Asperger's. I'm glad that Copperman/Cohen does it well. He has much experience with Asperger's, so it's not difficult at all for him to get it right.